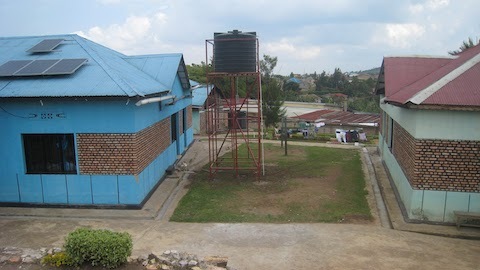 A new water tank serves two houses. The blue house is the Sewing Center; light green the girls’ home and Dental Clinic. This tank allows us to have a better water supply for both houses and to upgrade our bathroom facilities. Such a needed improvement! We are honoring the martial arts this month. Our karate kids are looking good. On my right is Eugene, Urukundo’s farm manager and instructor for the karate students. Black belts are hard to earn. From our karate school, we have eight. I have yet to even be given the proper clothes so I have no belt. What makes P6 boys happy? Of course, a gift of much needed sports balls. These arrived and are so appreciated. Volleyball, basketball and soccer balls. 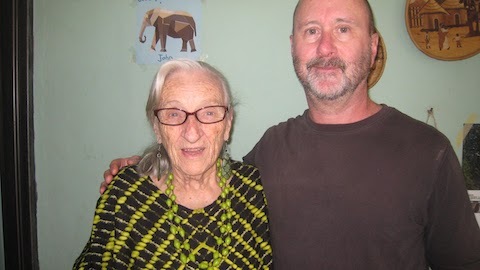 Early in February, Ray O’Keefe from Seattle, Washington, USA, dropped by. Literally, he did drop by. I did not know he was in Rwanda. Ray is Chief Nurse Anesthetist at Providence Washington Anesthesia Services, PC, Providence Regional Medical Center, Everett, Washington. Ray and his wife, Sarah Ketchley, our website manager, have been part of the Urukundo family for 10 years. Ray was in Rwanda with a team of surgeons and anesthetists on a medical mission. He took time on his rest day to come visit Urukundo and give me a hug from Sarah. Ray and his family support, love and pray for our own John Paul Nziyumanganya. John Paul just recently returned to Urukundo after furthering his education in Seattle, Washington. Thanks to Ray and Sarah’s devotion, he is now a full time physical education teacher at Urukundo Learning Center. The Dental Clinic had a real boost in February. 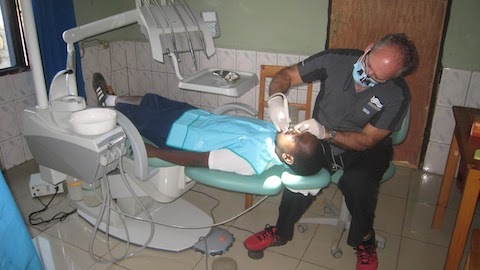 We are always happy to welcome a visiting dentist from abroad. Dr. Troy Michelson and his wife and assistant, Charmaine, are very appreciated. They hail from Calgary, Alberta, Canada. This is their third journey to Urukundo Village. The day care was blessed by their daughter, Alina Michelson, who was accompanying her parents for the first time. She brought her best friend, Kristina Le May. Both girls said they will be back. 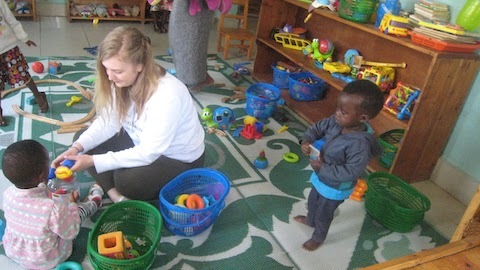 After a day of rest and touring Urukundo Village and Learning Center, Troy and Charmaine got down to serious business. They started by scanning and treating, if necessary, all P5 and P6 students at our school. Reports were sent home to their parents. Students waited to register. Ishmal, our clerk and recorder, filled in forms. Dr. Troy and Charmaine are a team worthy of praise. Suction, anyone? Oliver, our full-time therapist, comes to the aid of Dr. Troy. Aline Ishimue, the newest addition to our dental staff, tried something new, thanks to Charmaine. Carol Falke came home for the eighth year in a row. She is family. 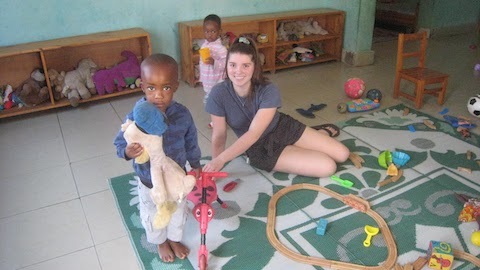 Carol is from State College, Pennsylvania, USA, and is president of the Hope Made Real board of directors. Urukundo and the Learning Center are blessed by her presence. What do you know about butterflies? Our preschoolers know a lot, thanks to Carol Falke. First, you read a book about caterpillars.Then you color and cut out. Next, you show them off. Windows also work well for this activity. Urukundo kids enjoyed playing Simon Says with the butterflies on the lawn at Mama’s house. The parade led by Carol topped the play time. Our medical student, Diescor Kirenga, is serving an internship at the University Teaching Hospital of Butare. He is a student at the University of Gitwe School of Medicine. He did not make it home for the holiday. He did get home later, looking every bit the doctor modeling his Christmas gift.